I thought I'd kick off the first of my 2015 posts with a bit of a fun idea, the supermarket outfit challenge! Unfortunately, you won't be seeing pictures of me running round a supermarket trying to fill my trolley up like a mad women, with Dale Winton shouting support in the background (did anyone else love supermarket sweep?!). Instead I decided that whilst on the weekly food shop, I was going to see if I could find myself a full outfit entirely from the clothes section of the shop. My chosen supermarket was Asda, and this is how it went.. I usually do my clothes shopping on a week night after work, or maybe on a quiet sunday morning, and always try to avoid the hell that is busy saturday shopping! So I decided to head down to the local Asda on a late Sunday morning. I wasn't expecting to find such a wide selection, but surprisingly there were plenty of isles dedicated to womens fashion that I could have a mooch around in. It wasn't too busy either which was good (although you do have to play 'dodge the pensioner' a bit to avoid getting stuck behind someone for a while!). I found that overall, although the majority of the clothes seemed to be targeted to an older age group, there were still plenty of nice items I liked and picked to try on. After lots of trying on and deliberation I finally decided on the finished outfit - a casual weekend wear look. The only thing in the outfit that isn't Asda is the fedora hat and the necklace - but I was pretty impressed that I managed to find everything else entirely from their range! I think the best part about supermarket outfit shopping is defintely the bargain prices combined with the fantastic quality of the clothes. When I pay £10 for a skirt in somewhere equally as cheap such as Primark, I expect the quality not to be great and know it's not an item that will last a long time. However I was so impressed with the material quality of all the items I got from George @ Asda - everything feels and looks like I will get plenty of wear out of it. So surprising for such low prices! Well, after my little experience I've decided I will now always have a look in the clothes section when on the food shop. Even if it's just for something simple like a basic top for layering - it's much better getting these types of items not only cheap, but of really decent quality so they'll actually last. This post was a great idea! I always have a little look in the clothes section when I'm in ASDA and have picked up a couple of lovely bags and shoes for so cheap :) it's amazing what great things you can find. That skirt really is gorgeous and you're definitely not the only one who loved Supermarket Sweep! I still enjoy an occasional watch even now if it's on, if I'm honest haha. Thanks so much for the kind comment :) Glad I'm not the only one that loved/still loves a bit of supermarket sweep! You definitely conquered the challenge!! This is such a chic outfit -- I never would have guessed that everything was purchased at a grocery store! I absolutely love the skort especially. Can't wait to see more of your outfits in 2015, Gabby! aaahh love the skort and coat!!! always so pretty and stylish!! 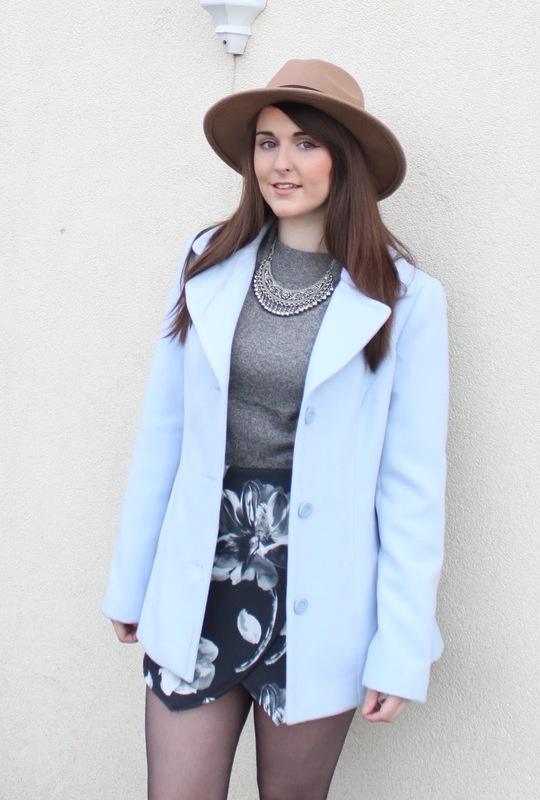 Adore the colour of the coat and the printed sort! You'd NEVER know this was a "supermarket" outfit! SO stylish. Thanks so much Lucia! I know I was really impressed with the items! Happy 2015, dear! May it be the best! I love these looks! Esp the blue coat! Check out my latest outfit post. What a fun and great idea haha the outfit came out cute!